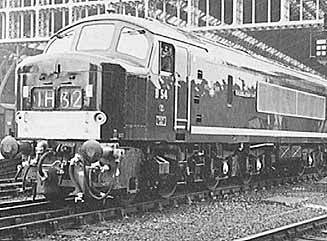 At St Pancras Station on 14 November the Corps joined with British Railways to name one of the latest diesel engines "The Royal Pioneer Corps." Hundreds of passengers left waiting rooms and departure platforms to watch this impressive ceremony on Platform 6. 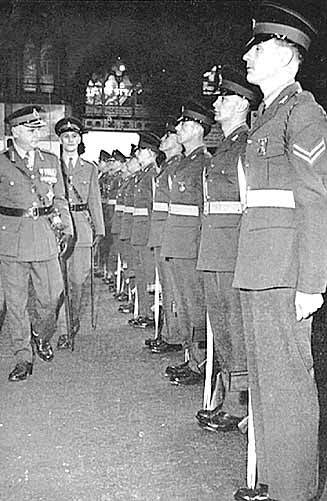 The Corps of Drums and a detachment of recruits from the Depot, under command of Lt J B Snowdon, gave the General salute on the arrival of the official party. The detachment bore witness to the smartness of the Pioneers in todays progressive Army. 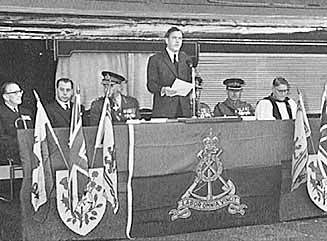 Lt Gen Sir John Cowley, KBE CB AM performed the naming ceremony at the invitation of Mr M C B Johns, Divisional Manager of the London Midland Region of British Railways. The other official guests were Maj Gen A Jolly CB CBE DSO, Vice Quartermaster General, The War Office, Brig C R Nicholls MBE DPL The War Office, Brig H G L Prynne CBE MC TD, Vice President and Chairman of the RPC Assn Council, The Rev G P H Rowson, CF, Chaplain of the RPC Depot, Mr T R Barron, Assistant Divisional Manager, British Railways and Mr J G Handley, Station Master of St Pancras, resplendent in traditional top hat and tails and with a brilliant scarlet carnation in his buttonhole. After inspecting the detachment and the Corps of Drums the Colonel Commandant was introduced to the old comrades. The ceremony was the first of its kind held in London for five years and the 2500 hp engine D54 is the first of the London Midland Region's fleet of mainline diesel locomotives to carry the name of a Corps of the British Army. Weighing over 135 tons and with an overall length of nearly 68 feet, it can easily maintain speeds of up to 90 miles per hour while pulling the heaviest of express passenger trains. Mr Johns said "We are proud of it. The locomotives of this series were the first big diesel-electrics to be designed and built by British Railways and they were the largest and most powerful erected in our own Railway Workshops". 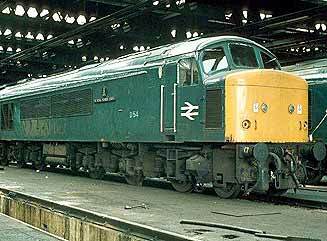 D54 was built at Crew and will operate between St Pancras and Manchester, Leeds, Bradford, Sheffield, Nottingham and Derby. It will also pull freight trains and will cover at least 400 to 500 miles daily. Mr Johns spoke of it as a Pioneer and said it will have ample opportunity to work. It takes the place of the Patriot Class steam engine named after the Corps by Field Marshall Viscount Montgomery in 1948 which was recently retired after covering well over 1,280,000 miles during its working life, and the name plates are now preserved in the Corps Museum. Pensioners at the naming ceremony. 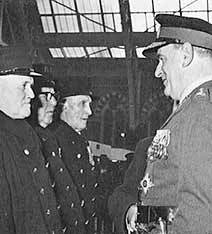 Mr Johns said that the mention of the word work "leads one to think immediately of the prodigious tasks performed by the Royal Pioneer Corps during World War II and to recall Field Marshal Montgomery's remarks at the 1948 naming ceremony, when he said that it was a very appropriate thing that British Railways should name an engine after a Corps with which the Railways had been so closely related during the War. He also pointed out that none of the work of the Corps had carried with it much glamour or limelight, but nevertheless it was vital to the final victory." Mr Johns added "These comments apply equally well to the locomotive here today, for it has once again brought the Corps and the Railways into close relationship and, while it may have less glamour and appeal than a steam engine, it will perform its work far more economically and therefore play a vital part in winning the Railways' battle for solvency. 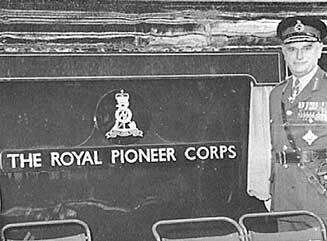 In reply Gen Cowley said it was significant that only fifteen years ago the latest type of steam engine was named "The Royal Pioneer Corps" and now it had been honourably retired. He said "This is a measure of the effort needed to keep a railway system up to date. A similar effort is required to keep the Army up to date and the Royal Pioneer Corps of today looks very different to the Corps in 1948. 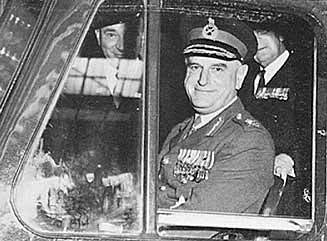 Then is consisted largely of National Servicemen doing their two years of compulsory service. Now it is a Corps of volunteers who have chosen soldiering as their profession - a smaller Corps but more efficient and better equipped. Like the new engine, in the words of Mr Johns, it has the ability of working many more hours a day with less attention, and the Army also is taking every advantage it can of these important capabilities, and is operating this Corps more intensively and for longer periods than its predecessor. 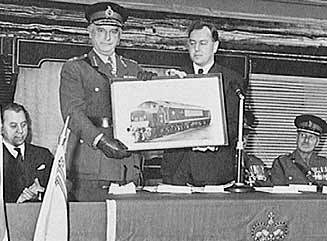 Declaring that he wished the engine many years of good service and expressing confidence that when it was eventually honourably retired it would have travelled about 1 and half million miles, or 6 times the distance to the moon, the Colonel Commandant then named the engine "The Royal Pioneer Corps" and unveiled the name plates. The giant locomotive was blessed by the Rev G P H Rowson, CF, Chaplain of the RPC Depot and the Vicar of the Church of the Holy Sepulchre, Northampton. 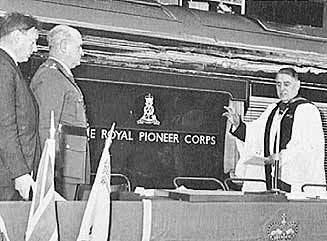 Gen Cowley then mounted the foot plate and with the special controller key started the engine for the first time under the name "The Royal Pioneer Corps." 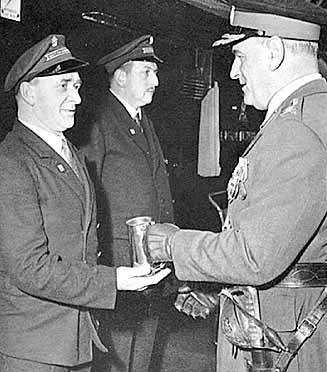 During the course of his address Mr Johns presented Gen Cowley with a framed photograph of the giant diesel and after the unveiling ceremony the Colonel Commandant was introduced to the driver, Mr J A Graham and the Secondman, Mr J Ratcliffe and presented them with suitably inscribed tankards, on behalf of past and present members of the Corps, in commemoration of the ceremony. The guest were invited to lunch at the Kings Cross Hotel during which the Colonel Commandant thanked Mr Johns and his colleagues on behalf of the Corps and the Association for permitting and arranging for the ceremony to take place. Two hours after the ceremony the 90 miles per hour diesel-electric engine "The Royal Pioneer Corps" was pulling the 3.25pm train out of St Pancras to Manchester. By chance one of the passengers aboard was Dr Beeching, Chairman of British Railways, whose hopes for the successful modernisation of his vast and intricate charge included the introduction of the hard working diesels like "The Royal Pioneer Corps." name "The Royal Pioneer Corps"